Discovered in 1811 in the Ilimaussaq intrusive complex in Greenland, sodalite did not become important as an ornamental stone until 1891 when vast deposits of fine material were discovered in Ontario, Canada. 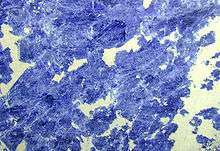 A light, relatively hard yet fragile mineral, sodalite is named after its sodium content; in mineralogy it may be classed as a feldspathoid. Well known for its blue color, sodalite may also be grey, yellow, green, or pink and is often mottled with white veins or patches. The more uniformly blue material is used in jewellery, where it is fashioned into cabochons and beads. Lesser material is more often seen as facing or inlay in various applications. Although somewhat similar to lazurite and lapis lazuli, sodalite rarely contains pyrite (a common inclusion in lapis) and its blue color is more like traditional royal blue rather than ultramarine. It is further distinguished from similar minerals by its white (rather than blue) streak. 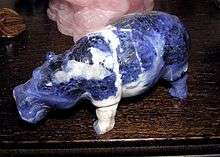 Sodalite's six directions of poor cleavage may be seen as incipient cracks running through the stone. It is sometimes referred to as "poor man's lapis" due to its similar color and the fact that is much less expensive. Its name comes from its high sodium content. Most sodalite will fluoresce orange under ultraviolet light, and hackmanite exhibits tenebrescence. Hackmanite is an important variety of sodalite exhibiting tenebrescence. When hackmanite from Mont Saint-Hilaire (Quebec) or Ilímaussaq (Greenland) is freshly quarried, it is generally pale to deep violet but the color fades quickly to greyish or greenish white. Conversely, hackmanite from Afghanistan and the Myanmar Republic (Burma) starts off creamy white but develops a violet to pink-red color in sunlight. If left in a dark environment for some time, the violet will fade again. Tenebrescence is accelerated by the use of longwave or, particularly, shortwave ultraviolet light. Much sodalite will also fluoresce a patchy orange under UV light. 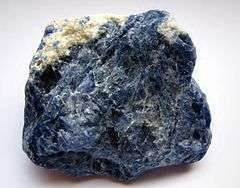 Occurring typically in massive form, sodalite is found as vein fillings in plutonic igneous rocks such as nepheline syenites. It is associated with other minerals typical of undersaturated environments, namely leucite, cancrinite and natrolite. Other associated minerals include nepheline, titanian andradite, aegirine, microcline, sanidine, albite, calcite, fluorite, ankerite and baryte. Significant deposits of fine material are restricted to but a few locales: Bancroft, Ontario, and Mont-Saint-Hilaire, Quebec, in Canada; and Litchfield, Maine, and Magnet Cove, Arkansas, in the US. The Ice River complex, near Golden, British Columbia, contains sodalite. Smaller deposits are found in South America (Brazil and Bolivia), Portugal, Romania, Burma and Russia. Hackmanite is found principally in Mont-Saint-Hilaire and Greenland. Euhedral, transparent crystals are found in northern Namibia and in the lavas of Vesuvius, Italy. Wikimedia Commons has media related to Sodalite.